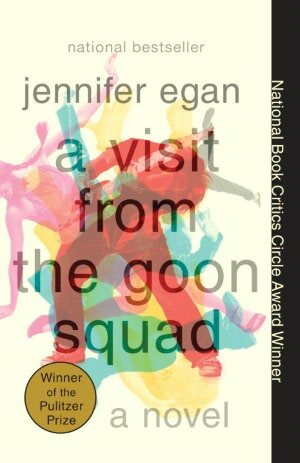 Since I’m a slow reader and perpetually behind the times, I’ve just now caught up with Jennifer Egan’s A Visit from the Goon Squad which won the Pulitzer Prize for Fiction last year. In the novel, Egan demonstrates her mastery of the essentials of fiction: character, story, structure, language, theme. And that’s precisely what’s wrong with Goon Squad. I know this is a strange criticism and it sounds like a cheap shot. After all, most writers (including, let’s be honest, me) would kill to display the talent and skill Egan displays in the book. The problem is that Egan has written herself into that Bermuda Triangle of Art where books of high craft that lack something – some quiddity or quirk, some inspiration or lucky accident or divine alchemy of personality and zeitgeist, some gimmick or obsession or passion – disappear. For example, The Great Gatsby is a high-craft novel that clearly has an IT that gets the book through the Triangle. But what the heck is the IT? There is nothing wrong with the multiple first person, but it tends to emphasize the isolation of the individual, while I think our lives gain meaning by our relationships with other people. Also, the human condition is defined by the single first person. There is only one “I” in each of our lives. Again, nothing wrong with this choice, and fiction needs more business people as its characters – as opposed to, say, professors in small college towns struggling with adultery, malignant envy of more successful colleagues, and campus politics. But business people spend a lot of time thinking about how to make money, and how you make money is not the most dramatic or emotionally gripping subject for me. Because, you know, no one living in New York City can just be ordinarily screwed up. No, they have to be extra-ordinarily screwed up. I admit, I’m a reverse snob. And also, there are many more characters that Egan handles with all the grace, delicacy, and compassion you could ask. So maybe I’m off base. Satire deals in caricature and exaggeration, and characters in satire are more mediums for commentary than the means to explore the deep mysteries of human nature. The two characters mentioned above clearly have an element of satire in them, and you could argue that their satiric nature is their primary function in Good Squad. But what are we to make of these characters when they exist in the same fictional world as characters such as Lou Kline, an amoral record producer who is given complex treatment and the dignity of a death scene that emphasizes his human frailty not his outsized faults? I feel it suggests some characters are more human than others. And that’s a problem – not merely a quibble over aesthetics or philosophy – because the idea that some people are more human than others is the justification for pernicious bigotry and outrageous violence our race all too happily grabs. I know this is a lot to lay on Egan, but it is ultimately an argument that art matters. Which means Goon Squad’s faults and virtues matter, too.